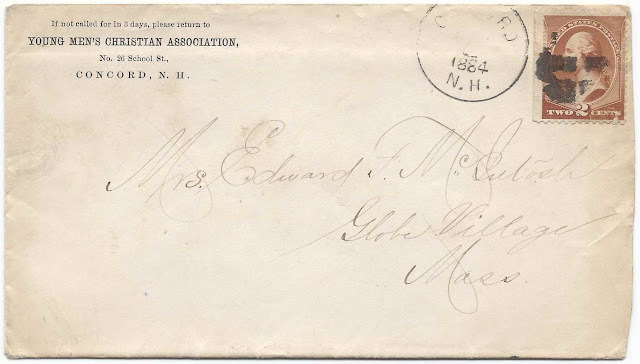 1884 letter sent by future New Haven, Connecticut gastro-enterologist, Edward Francis McIntosh, using stationery from the Young Men's Christian Association at 26 School Street, Concord, New Hampshire, to his wife at Globe Village, Massachusetts. I found at least two places in Massachusetts called Globe Village, one at Southbridge and the other at Fall River. 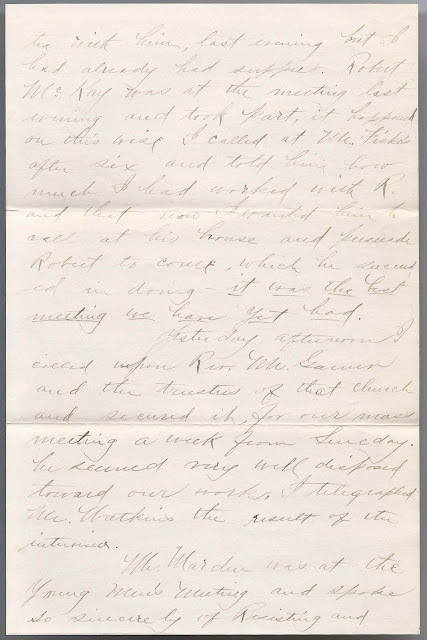 However, since the couple were married at Southbridge, I'm presuming that Mrs. McIntosh was at Southbridge at the time the letter was written. The writer appears to be working with the Temperance movement. Some years later, he would enter Yale Medical College where he received his medical degree in 1897. A transcription follows each page. If you're able to fill in the blanks or if you feel that I interpreted a word incorrectly, please leave a comment or contact me directly so that I can correct it. tea with him last evening but I had already had supper. Robert McKay was at the meeting last evening and took part. It happened on this wise. 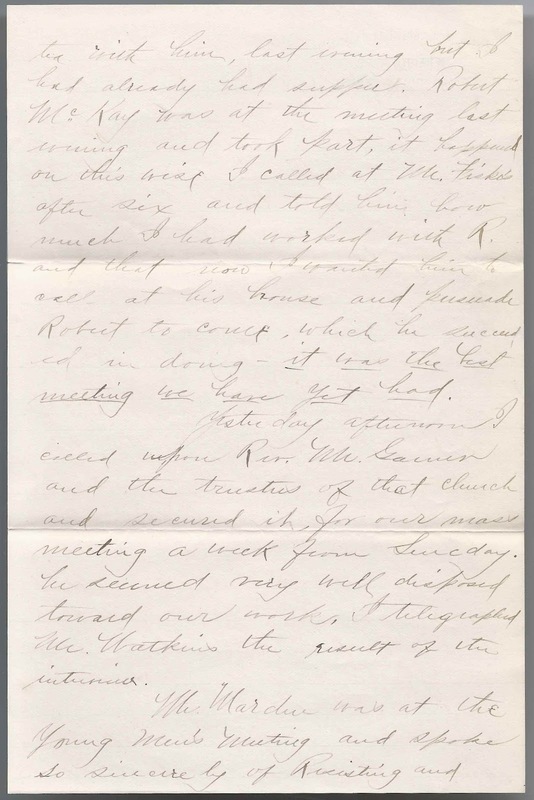 I called at Mr. Fiske's after six and told him how much I had worked with R. and that now I wanted him to call at his house and persuade Robert to come, which he succeeded in doing. It was the best meeting we have yet had. Yesterday afternoon I called upon Rev. Mr. Garner and the trustees of that church and secured it for our mass meeting a week from Sunday. He seemed very well disposed toward our work. I telegraphed Mr. Watkins the result of the interview. ____ the spirit. Mr. Fiske partially broke down with excess of feeling, while making prayer, and two others could hardly in testimony and prayer finish their work, there was such an overwhelming sense of the presence of the spirit, it was indeed one of the richest experiences of my Christian life. other kind of comfort (except lowly ones). I will send papers with trial in them so you can see how they are coming out. Tell mother that her wish is the only thing on earth that would persuade me to allow you to be drawn from me in this way, but I think I can get through if you don't stay too long. I look for a letter today. Have a good time and then come back to Ted. Edward Francis McIntosh was born 2 March 1860 at Dorchester, Massachusetts, son of William Francis McIntosh and Betsey Avis (Bowen) McIntosh. I believe that Edward's paternal grandparents were William Briggs McIntosh and Matilda G. (Bowen) McIntosh, and that his maternal grandparents were Zenas and Betsey (Hopkins) Bowen. On 27 November 1883 at Southbridge, Massachusetts, Edward married Harriet "Hattie" Lucretia (Hyde) Moulton, daughter of John, Jr., and Sarah Brigham (Mosman) Hyde. Hattie was born 24 September 1849 at Winchendon, Massachusetts. Hattie's age difference with Edward shrank as time went on. I believe Hattie's paternal grandparents were John and Abigail (Hyde or Hude, possibly, unless she had been married before) Hyde; and that Hattie's maternal grandparents were Samuel, Jr., and Betsey (Brigham) Mosman. Hattie had previously been married to photographer Horatio Davis Moulton, son of Joseph C. and Susan (Park) Moulton of Fitchburg, Massachusetts. Horatio and Hattie had a son George D. Moulton born in 1873. Apparently the marriage of Hattie and Horatio ended in divorce. Elizabeth, born about July 1888 after the family had moved to Connecticut. Elizabeth married Russell E. Chatfield. Etta, born about November 1890 in Connecticut. Etta married Rufus F. Blount. At the age of 37 in 1897, Edward F. McIntosh received his medical degree from Yale Medical College. He practiced at New Haven and specialized in gastro-enterology. For several years he taught courses in that specialty at Yale Medical College. See more information on Edward Francis McIntosh here. If you have corrections to the information above, or additions to it, please leave a comment or contact me directly. Thanks!